Dr. Christopher Whyte hails from Portland, Oregon. 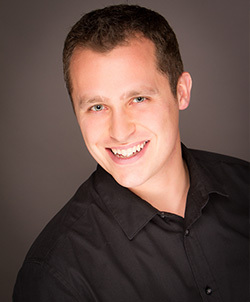 He is currently Assistant Professor of Music and Director of Percussion Studies at Western Oregon University. He recently completed the Doctor of Musical Arts in Percussion Performance from Boston University, where he was a student of Boston Symphony Principal Timpanist Timothy Genis. Whyte performs frequently in the Portland area as a freelance percussionist and timpanist with The Oregon Symphony, the Portland Opera Orchestra, Third Angle Contemporary Ensemble, FearNoMusic, The Bach Cantata Choir, The Portland Symphonic Choir and the Portland Gay Men’s Chorus. He has also performed with the Vancouver Symphony, Atlantic Symphony, the New Bedford Symphony, the Eugene Symphony, the Newport Symphony, ALEA III contemporary music ensemble and the Boston Civic Symphony, among others. The Boston Musical Intelligencer called Whyte’s playing “a striking diversity of styles and spirit.” Whyte has worked closely with composers William Kraft, Pauline Oliveros, Allen Strange, Stephen Taylor, Michael Johanson, Mendel Lee and Gabriela Lena Frank, among others. He is co-founder of the Portland Percussion Group, a contemporary percussion quartet based in Portland, Oregon that strives to foster and promote percussion performance through engaging concerts, educational outreach and the creation of new works in the chamber percussion genre. The Portland Percussion Group is active in developing relationships with new composers and the commissioning of new works throughout the Northwest region. Whyte also earned degrees at the University of Oregon as a student of the late Charles Dowd. While at the University of Oregon, he won the University of Oregon Concerto Competition and performed with a number of professional orchestras and chamber music ensembles in the Northwest region. Whyte has works published through Tapspace, MSC, Matrix, and Bachovich publishing companies, and can be heard on recordings from Pentatone Classics. Chris is also actively involved in the marching percussion activity. He has performed with the Cascades, Bluecoats, and Blue Devils drum corps, and has arranged and taught for the Oregon Crusaders, Cascades and Madison Scouts. He is currently the Front Ensemble Arranger for the Oregon Crusaders, the Percussion Arranger for the Cascades, arranger and designer for the OC Indoor Percussion Ensemble, and remains active as a percussion arranger for a number of high school percussion programs throughout the United States. Whyte has presented percussion clinics and given masterclasses at universities throughout the Midwest and western United States and continues to be in demand as a clinician for both collegiate and high school programs. Chris is a Yamaha Performing Artist, and proudly endorses Vic Firth Drumsticks and Remo Drum heads. Chris lives in Portland, Oregon with his wife Charlotte and their Akita, Decan.